Saurischia is one of the two orders of dinosaurs. The name translates to "lizard-hipped," meaning that the pelvis of these animals consists of three elements: the ilium, ischium, and pubis. 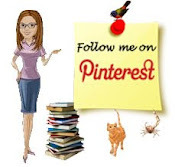 The orientation of the pubis, in particular, is such that it points downward and forward at an angle to the ischium.. The saurischian dinosaurs are then divided into two major groups: Sauropoda (large herbivores) and Theropoda (bipedal carnivores). Sauropoda is the second most diverse group of dinosaurs with more than 150 valid recognized species. This group of dinos also includes the largest terrestrial vertebrates to have ever existed, with the smallest growing to 20 feet long. Typically, the animals in this group had very long necks and tails, relatively small skulls and brains, and thick, pillar-like legs. They were a long-lived group, evolutionarily speaking, spanning 100+ million years, appearing in the Late Triassic and becoming widespread during the Mesozoic. They fed on various plant species of the time, either aquatic or terrestrial, and were very likely gregarious, forming herds. To this day, sauropods are some of the most recognizable dinosaurs there are. 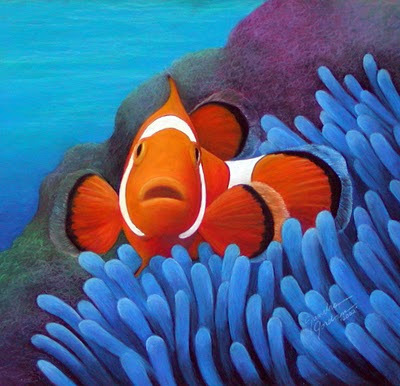 They are an extremely widespread group and have been found on every continental landmass except Antarctica. Until now. A new paper in the journal Naturwissenschaften reports on a new sauropod fossil find in Antarctica. Consider your average paleontological expedition: the hiking, the fossil hunting, the hammering, the tiny little brushes. Now consider all of that in the frozen land that is Antarctica. Despite these arduous collecting conditions, there have been some important fossil finds on this continent in the last couple of decades, particularly in the James Ross Basin. If you are familiar with Antarctic geography, or just search for Google a map of it, then you'll notice that the James Ross Basin is located in the Weddell Sea, adjacent to the northern part of the Antarctic Peninsula. Yep, that's marine. However, there are exposed areas on James Ross, Vega, Snow Hill, Seymour, and Cockburn islands that expose shallow marine shelf deposits of the Upper Cretaceous and Paleogene sedimentary sequence and the fossils buried within it. This is where the new bone was located. 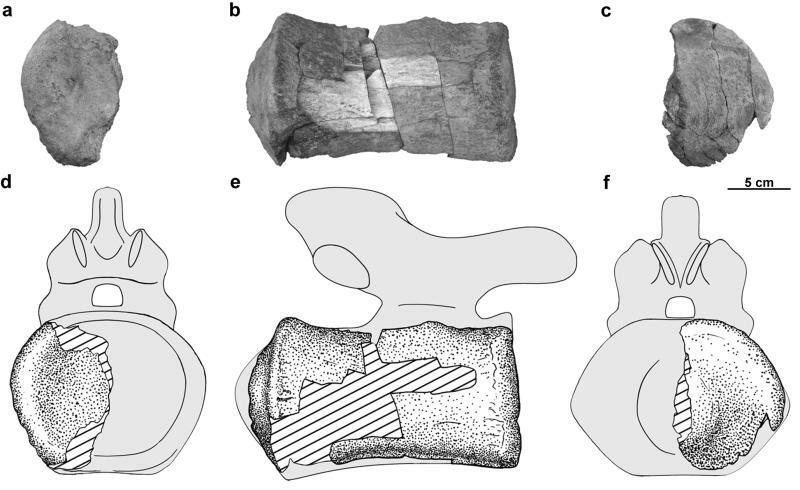 The new sauropod fossil is from the tailbone of a sauropod exhibiting common characteristics of advanced titanosauriform sauropods (Titanosauria), particularly lithostrotian titanosaurs. Titanosauria includes over 40 known species that range in size from dwarf (size reduction through evolution) to gigantic (including some of the heaviest of the dinosaurs). These dinosaurs had small (even when compared to other sauropods), wide heads with large nostrils and spoon-like teeth. They had relatively short necks (again, in comparison to other sauropods) and long whip-like tails. Titanosaurs also had slimmer hips but a wider chest, giving them a wide-gauged stance, resulting in broader tracks. Lithostrotian titanosaurs originated during the Early Cretaceous and were the predominant group of sauropods until the mass extinction at the end of the Cretaceous. They have been found on all continents, but are particularly abundant in South America. 1. The presence of the titanosaur is a result of a dispersal event from South America through a paleoisthmus (a long ago land bridge) between Patagonia and the Antarctic Peninsula during the Late Cretaceous . This is a hypothesis that has already been proposed for hadrosaur dinosaurs in Antarctica. 2. Titanosaurs were already present in Antarctica during the Early Cretaceous or earlier. This hypothesis is supported by evidence of lithostrotian titanosaurs in the Albian of Australia and is consistent with studies showing many dinosaur clades spreading across Pangaea or Gondwana prior to the continental fragmentation during the Cretaceous. Can they put a name to this new dinosaur? Not yet. They really only have 1 bone of 1 dinosaur. The important, take-home point of this paper is that a group of dinosaurs has been found on a continent for the first time. It will be interesting to see what other dinosaurs once lived on this very large continent. 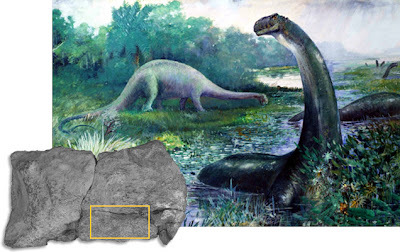 ScienceShot article "Giant Dino Lived in Antarctica"
Science Daily's article "Plant-Eating Dinosaur Discovered in Antarctica"
* Figure 2 from the paper showing the discovered sauropod fossil: "Lithostrotian gen. et sp. indet. 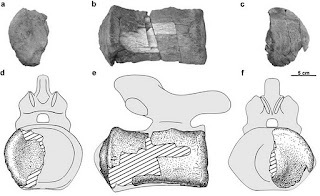 MLP 11-II-20-1 caudal vertebra centrum, photograph (a–c) and interpretative drawing (d–f) in anterior (a, d), right lateral (b, e), and posterior (c, f) views"